These creative recipes from our food editor Beth Lipton's new book, Peaches, help you get the most out of this versatile summer treat. Summer is the perfect time for peaches—a classic farmers' market staple that is not only juicy and refreshing, but also packed with essential nutrients, like vitamins C and E, calcium, and iron. 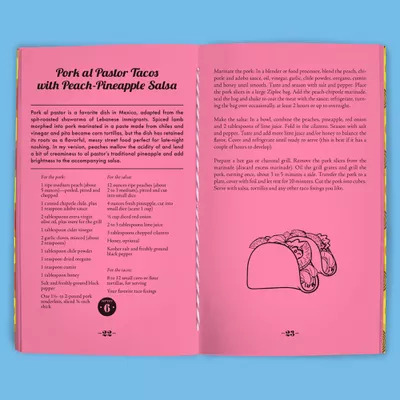 Here are three creative recipes from Peaches ($14, shortstackededitions.com), a new cookbook from Health's food director, Beth Lipton, to help you make the most of this healthy and versatile seasonal treat. "Take a tarte Tatin, mate it with a buttery cake, and the resulting love child is this fancy-looking but simple dessert," Lipton writes. "The strong butter flavor and a little hint of ginger are a delicious setting for the slightly boozy, very brown sugary sauteed peaches." Place a rack in the center of the oven and preheat to 350°. Butter a 9-inch-round cake pan. In a bowl, combine the flour, ginger, baking powder, baking soda, and salt; whisk until well mixed and set aside. Cut 4 tablespoons of butter into slices and place in a large skillet. Add the brown sugar, 1 teaspoon of vanilla, bourbon, and a pinch of salt and cook over medium-low heat, stirring occasionally, until the butter has melted and the mixture is well combined. Add the peach slices and cook, gently stirring occasionally, until they begin to soften and their liquid thickens, 7 to 9 minutes. 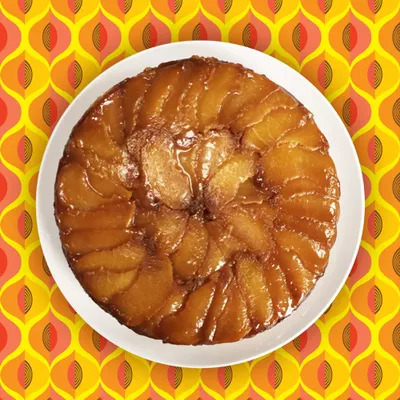 Using a slotted spoon or tongs, remove the peach slices and arrange them in circles in the bottom of the cake pan, beginning on the outside and moving into the middle of the pan, overlapping if necessary (you may not use all of the slices; save any extras for snacking or another use). Pour the remaining juices from the skillet over the peaches, taking care not to move them. In a separate bowl, using an electric mixer, beat the remaining 8 tablespoons of butter with the granulated sugar at medium-high speed until light and fluffy, 2 to 3 minutes. Add the eggs, one at a time, beating well after each addition. Scrape down the side of the bowl. Using a wooden spoon or sturdy spatula, stir in half of the flour mixture, followed by the buttermilk and remaining teaspoon of vanilla, then the remaining flour mixture, stirring until just combined. Using an offset spatula, gently spread the batter over the peaches, taking care not to move them too much. Bake for 30 to 40 minutes, until the cake is golden and bounces back when lightly pressed in the center. Let the cake cool in the pan on a wire rack for 5 minutes. Run a knife along the outer edge of the pan and invert the cake onto a serving dish. If any peach slices are stuck in the baking pan, carefully place them on top of the cake. Serve warm or at room temperature with ice cream or whipped cream. 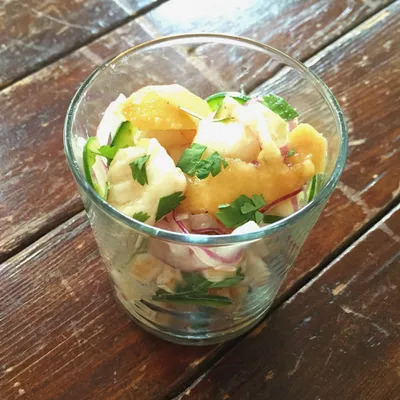 Best thing about ceviche in the summer: You don't have to go near a stove, Lipton writes. "Peaches set this ceviche apart from others I’ve tried; the fruit’s sweetness balances the salty fish and spicy jalapeño and makes the whole thing just scream 'summer.' Plus, the peaches add a burst of color that plays well with the pink in the shrimp and the green of the chile." You can also try serving it in small paper cups at a party. Place the onion, peach, jalapeño, halibut, and shrimp in a nonreactive bowl. Stir in the lime and lemon juices and a large pinch of salt. Cover the bowl and refrigerate for 1 hour, stirring every 15 minutes or so. Drain the fish mixture and return to the bowl. Stir in the oil. Taste and season generously with salt and pepper. Gently stir in the cilantro. Spoon the ceviche into glasses, garnish with the lime zest, if desired, and serve. 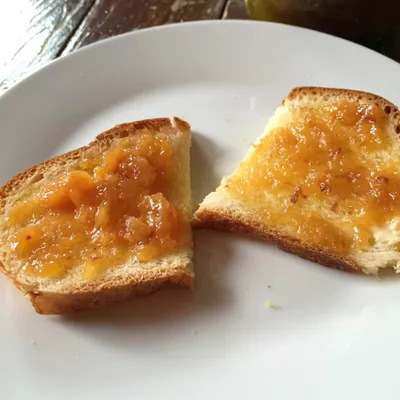 As Lipton explains in Peaches, this recipe adopts the techniques of French jam maker Christine Ferber, who macerates the fruit overnight, cooks the resulting syrup first, and then returns the fruit to the cooked syrup. The result: jam that just screams fruit. This is especially important with peach preserves. Using this method, the fruit itself isn’t cooked as much, so it retains its essential peachiness. Combine the peaches, sugar, lemon juice, and salt in a large bowl. Cover and refrigerate for at least 8 hours or overnight. Place a fine-mesh sieve over a large saucepan. Pour the peach mixture into the sieve and let the fruit’s juices collect in the pan. Reserve the solids, place the pan over medium heat and bring to a boil. Boil, stirring often, until the liquid is syrupy and reduced by half, about 8 minutes. Add the peach mixture to the pan and bring back to a boil. Cook, stirring occasionally, until the peaches are very soft, 15 to 20 minutes. Crush the peaches with the back of a wooden spoon as they cook (for a smoother preserve, use an immersion blender). Transfer the preserves to a large bowl to cool. Spoon the peach preserves into a pint-size jar with a tight-fitting lid and refrigerate. The preserves will keep, covered and refrigerated, for up to 3 weeks. Or seal the preserves in sterilized jars using the boiling water method and store at room temperature. For more cool summer recipes celebrating all things peach, be sure to check out the rest of Lipton's cookbook!